Saturday October 15th saw record electricity production from Ontario's wind turbines. No coal-fired generation was replaced, and emissions for electricity generation in Ontario were not reduced. The initial IESO data shows 31,328MWh of generation during the 15th, which is a record. Hour 16 has 1416MW recorded, which broke the old record of 1345MW (from February), as did production in the following 3 hours. Unfortunately, the autumn return of big wind output occurred following, as expected, the high-demand summer season that saw wind production capacity factors drop to 13.6% in July. The market price managed to stay positive until 10 pm, but dropped to negative $128.10/MWh by 2 a.m. on the morning of the 16th. At that time exporters were being paid about $200,000 to take our excess power, and we were paying Bruce Power to perform steam bypasses, to avoid power production, at units 7 and 8 (curtailing close to 600MW of production - likely at a cost of about $35,000 an hour). Hydro production was also reduced, to only 1624 MW, which is near annual lows. Hydro production thus far in October is very low (averaging approximately 2800MW, compared to previous, low production, years averaging 3500MW). 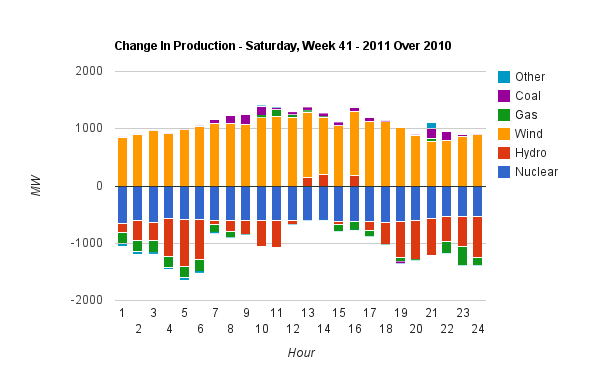 I've been finding the reduction in hydro output curious, so I decided to compare production from Saturday October 15th, 2011, to the production from Saturday, October 16th, 2010. The findings from that comparison meet the expectations from my recent work in forecasting the impact of increased wind generation capacity in Ontario. Specifically, wind can't replace coal, or gas, during the many points in time where there is no coal or gas generation to replace. Wind frequently replaces nuclear and hydro. The comparison of this years high-wind output Saturday to the comparable Saturday last year, not only shows wind didn't replace coal, the two dates actually have about the same GHG emissions (treating coal as having twice the emissions intensity of natural gas). NOTE 10/11/2011: There is now a discrepancy between this report and the the IESO historical text file, which currently has dropped the generation totals for the Comber and Greenwich IWT installations, lowering the wind totals below record levels. All 3 of these generators are yet to have 'operational dates', which is the time I start to measure their presence in calculating system-wide capacity factors, but all are feeding the grid according to the hourly data, and presumably being paid to do so.